Sign A Birthday Card for Ben Cohen of Ben & Jerry’s! Let Ben know how much you appreciate his leadership in the movement for corporate social responsibility by signing the card below. Then check out his latest idea, Stamp Stampede, which aims to take money out of politics and have fun doing it. You can also sign up for the Ice Cream Social newsletter. March 18 is your 63rd birthday. Many happy returns, and heartfelt thanks. Thousands of social entrepreneurs are now following the trails your company blazed, and you deserve a lot of credit for that. Mary Been, Sault Ste. Marie, MI U.S.
7 Responses to Sign A Birthday Card for Ben Cohen of Ben & Jerry’s! Cool idea. We will rebroadcast to our farm fans. I would like to be an agent for Ben and Jerry’s in my country PAPUA NEW GUINEA. Please contact me for more details. 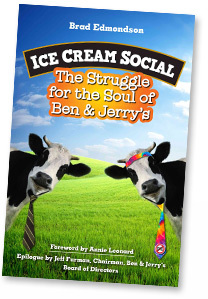 FAQs: Why Didn’t Ben and Jerry Talk? Hey, Tampa Bay! Brad & Free Ice Cream!